Nova Roma participated on 12 August at the international Nicopolis Ad Istrum Festival, in Nikyup, Bulgaria, an international Roman festival of Veliko Tarnovo city. The event was organized by A. Vitellius Celsus, praefectus of the Bulgarian Nova Romans. 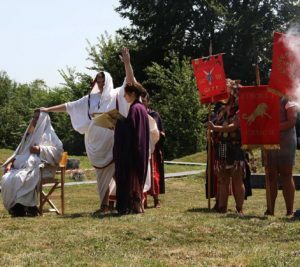 This event hosted the interprovincial convention of Bulgarian Nova Romans, led by praefectus A. Vitellius, and a delegation of 5 Pannonian Nova Romans (Hungary), led by legatus pro praetore Cn. Cornelius Lentulus. As the culmination of the event, the Bulgarian community of Nova Romans, who had demonstrated successful and meritorious activity and growth during the years of preparation to become the newest addition to Nova Roma, were elevated to the rank of “provincia” according to the recent decree of the non-corporate Senate of Nova Roma: the highest recognition and honor a Roman group can achieve. With the involvement of pontifex Cn. Lentulus, special envoy of the Senate sent to establish the province, Provincia Thracia of Nova Roma was founded by proper rites and ceremonies, and its first governor, A. Vitellius was inaugurated as legatus pro praetore of NR Thracia.